Gun (left) and Kant play the Ravel concerto at Ben’s Theatre in Pattaya. If you didn’t manage to get along to the recent concert at Ben’s Theater in Jomtien you missed an amazing evening. 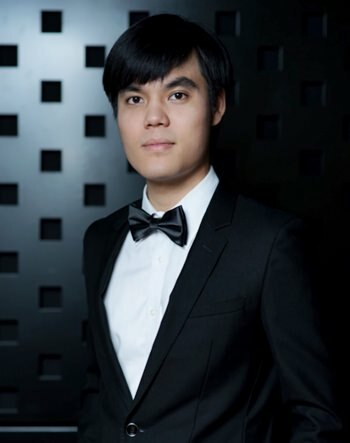 The star of the show was the young Thai prize-winning pianist Gun Chaikittiwatana, who presented a programme of music by Bach, Brahms, Chopin, Saint-Saëns, Debussy and Ravel. The concert mostly featured music composed for the left hand. Some people think it’s an odd and remarkable thing that piano music exists for one hand. But there are hundreds of examples. In his book entitled One Handed: A Guide to Piano Music for One Hand the American pianist Donald Patterson identifies over two thousand such works. Interestingly, the vast majority of these pieces are for the left hand rather than the right, but I shall leave you to ponder this interesting statistic and form your own conclusions. It wasn’t until the invention of the damper pedal in the nineteenth century that one-handed piano music became a reality. 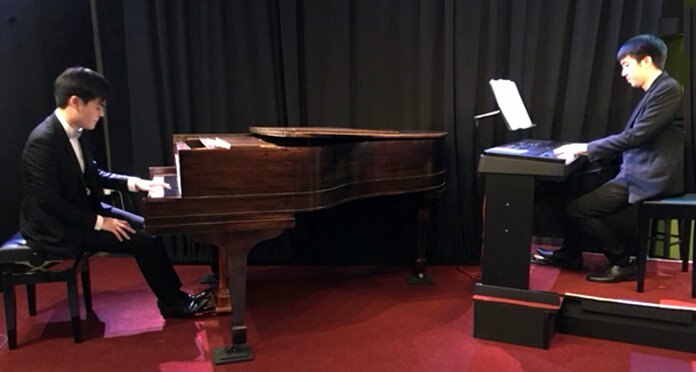 The sustaining pedal and the central sostenuto pedal opened new composing possibilities because they allowed notes to sound after the keys had been released. Introducing the programme himself in English, Gun then gave a measured and impressive performance of the Bach, bringing out the melodic lines clearly with a beautiful sense of phrase. His playing reminded me of Debussy’s cryptic remark that “the music lies in the spaces between the notes”. Gun then played Six Studies for the Left Hand written in 1912 by Camille Saint-Saëns. In the form of a Baroque suite, each movement presents different technical challenges. But there’s also a French lightness of touch, something in which Saint-Saëns excelled and which Gun brought out in his confident performance. One sensed the intense rhythmic vitality of music, the elegant phrasing, the rich expressive qualities and the touches of Gallic humour. Before Ravel began this concerto in 1929, he poured over the Studies for the Left Hand by Saint-Saëns, absorbing the composing techniques. The concerto was written for Austrian pianist Paul Wittgenstein whose right arm was amputated after he was wounded during WW1. He was incidentally, the elder brother of philosopher Ludwig Wittgenstein. Ravel’s concerto is a powerful, dramatic work with subtle jazz influences and makes extraordinary demands on the soloist. The mysterious opening gradually builds tension and leads into a jaunty, galumphing melody which dominates the work. Gun played this effortlessly, accompanied by insistent repeated choral patterns played by Kant with impeccable precision on the second piano. The concerto culminates in a monumental cadenza and Gun gave a heroic performance. The sound of the 100-year-old Stieff grand piano and the Yamaha digital piano blended surprisingly well. This two-piano version of the concerto was a musical revelation, because the complex orchestral parts were revealed in striking clarity. Gun and Kant gave a truly dazzling performance which displayed brilliant virtuosity, technical assurance, precise ensemble playing and splendid musicianship. To my mind, this was one of the finest musical performances that Ben’s Theater has ever presented.